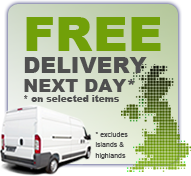 Deliveries to all mainland UK locations except the Highlands and IOW are free. Orders are delivered within the time frame shown on the listing or on the date you specify with many items available with free next working day delivery service. A standard delivery will ensure that you receive the goods within the time frame shown on the listing or on the date you specify. Standard delivery including next day delivery is free. *Please note for Next Working Day Delivery service orders must be placed before 3pm orders placed after 3pm will be dispatched the following working day. Selecting AM delivery will ensure that you receive the goods within the time frame shown on the listing or on the date you specify before 12pm. The cost for this service is £5.00 for the total order. AM deliveries are only available for UK mainland orders. Selecting Saturday or Sunday delivery will ensure you receive the goods on the Saturday or Sunday you specify. The cost of the Saturday or Sunday Delivery service is £15.00 for the total order. Saturday deliveries are only available for UK mainland orders. Our courier DPD treats all areas north of Dundee as the Highlands, also for deliveries to the Isle of Wight please select this option. A standard delivery will ensure that you receive the goods within the time frame shown on the listing or on the date you specify. If next working day delivery is available on the products you have selected this will change to delivery within 2 Working Days. The cost for Highlands standard delivery service is £15.00 for the total order. Please select this option for Channel Islands, Isle of Man, N. Ireland, S. Ireland, Scilly Isles and Scottish Islands. An Islands standard delivery will ensure that you receive the goods within the time frame shown on the listing or on the date you specify. If next working day delivery is available on the products you have selected this will change to delivery within 2 working days. The cost for Islands standard delivery is £15.00 for the total order. For the purposes of this delivery information a working day is Monday to Friday. Saturday, Sunday and Bank Holidays are not classed as working days. Next working day delivery service orders placed on Saturday, Sunday and bank Holidays will be dispatched the next available working day.